A low creeping evergreen groundcover, this forms a spreading mat of wiry stems, clothed in tiny rounded leaves with a glossy green finish. Fall and winter colour is an attractive bronze green. Insignificant green flowers become black-seeded white berries in late summer. Great for large areas and stabilizing slopes. Vigorous habit. Space at 4 to 6 plants per square yard. Plants may be mown once a year in the spring to encourage thicker growth. Good in combination with spring flowering bulbs. Tolerates fairly high foot traffic and dry conditions, once established. 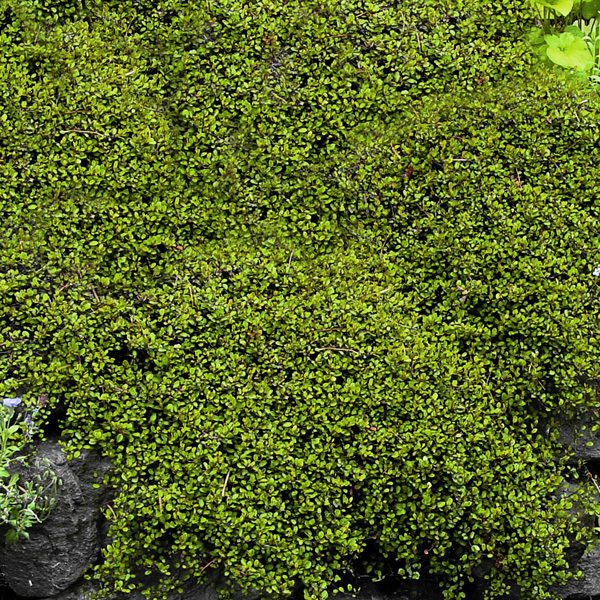 Too vigorous for the rock garden or perennial border. Avoid planting between pathway flagstones as this may become a trip hazard.